Last week, the WAHTN hosted Electra Goodwin, a year 10 student for a week of work experience, under the supervision of Dr Alexandra Heaton. Electra helped update the WAHTN database of medical researchers to include the names, affiliations and key research areas of medical researchers in Western Australia. Electra collated this information and uploaded it onto the new WAHTN smartphone app. The WAHTN app now contains a list of over 400 medical researchers based in WA. During her week of work experience, she was introduced to several enthusiastic scientists including Dr’s Aaron Muscat and Christian Pflueger. 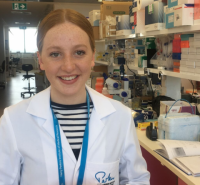 She toured the labs at the Harry Perkins Institute, learnt about exciting research currently underway and was able to see molecular techniques and microscopy in action. Her writing skills were put to use and she published the previous news article on the WAHTN website congratulating Andrew Whitehouse on his recent award (read it HERE). On her last day, Dr Heaton explained the process of journal article publication via peer review. Electra was invited to read a recently submitted manuscript regarding a large randomised control trial of fish oil supplementation in Perth children. Electra said that she had extremely enjoyed her time at Perkins, and was inspired by the research going on (particularly in epigenetics) and the amazing people working there. She is continuing her studies in Science at St Hilda’s Anglican School for Girls and hopes to pursue a career in science and/or medicine in the future.